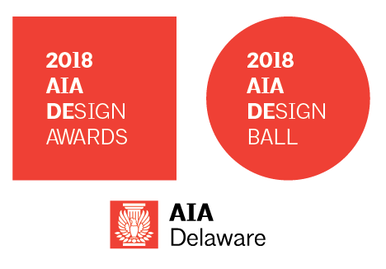 By recognizing AIA Delaware member projects and showcasing Delaware's architectural community, the AIA DEsign Ball will honor the design profession, construction industry and our design professionals. ​AIA Delaware invites businesses and community organizations to consider a sponsorship opportunity in the 2018 Design Awards Program. ​AIA Delaware is a 501(c)(6) non-profit professional business league serving the architectural community and its allied members in all of the building and construction fields. 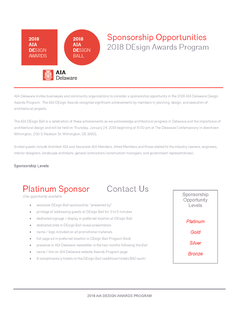 ​Please direct all questions regarding sponsorship opportunities to AIA Delaware Executive Director Nancy Payne at director@aiadelaware.org or (302) 654-9817 or to Phil Conte, AIA, 2018 DEsign Awards Program Chairperson at contep@studiojaed.com or (302) 832-1652. ​and from small firms and large.